Some chance. With his great white beard and pale skin, Byrne is just about the most identifiable man in Scotland. He’s sitting in a basement café in Edinburgh, every inch the dandy, from the pink scarf wrapped round his neck to the bare feet thrust into his ankle boots. As if to ensure that he is the centre of attention, he is in the Traverse Theatre, scene of his 1978 stage triumph, the Slab Boys, a place where he’s pointed at by punters and greeted by old chums. Their admiration is understandable. 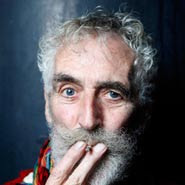 Byrne won six Baftas for his bittersweet TV series, Tutti Frutti and was the prizewinning graduate of Glasgow School of Art who went on to portray the Beatles. Yet for all his manifest brilliance, at 69, there are some who refuse to recognise him for anything other than one half — or one third — of a celebrity partnership. For 15 years he was the companion of Tilda Swinton, that rare thing, a British actor with Hollywood cachet. Byrne was habitually portrayed as the older man, 21 years her senior, a father figure and rock for Swinton’s jet-setting career. Then, in March last year, Swinton revealed that she was in love with Sandro Kopp, an artist 17 years her junior. Since it seemed the domestic arrangements comprised Byrne, Swinton and Kopp in the same (albeit massive) house at Nairn in the Scottish Highlands, a prurient press descended. Ever afterwards, to a great or lesser degree, Byrne has been pursued by reporters. And he’s sick of it. Even today, he took a call from a tabloid journalist prying into his domestic arrangements. For three years he has been in a relationship of his own and here, he says, are the brief facts of the matter. The “wonderful woman” he has met is Jeanine Davies, a stage lighting designer. Last December, he moved in with her, in a house across the street from Swinton and Kopp. And no he doesn’t spend all his time looking after his two young children — Swinton and Byrne have employed a childminder to do that. Byrne hates talking about this relationship stuff, his discomfort only amplified by the preceding hour, when he was lost in reverie about Tutti Frutti. After inexplicable wranglings over copyright and distribution, the series is to be aired again on BBC Four and a DVD went on sale a month ago. It flashed straight to the top of the chart at online retailer Amazon, where it remains in the top five bestsellers despite briefly selling out. The plot centres around the Majestics, a band of aged rock’n’rollers, and two young pretenders, who set off together on a “Silver Jubilee Tour” of dead-end, provincial Scotland. Along the way, the journey made stars of Robbie Coltrane and Emma Thompson and transformed Byrne into one of the most sought-after writing talents in television. Tutti Frutti oozes its author’s humanity and the making of the thing says everything about his creative intensity. Handed a title and the idea for the band by Bill Bryden, head of drama at BBC Scotland, Byrne took himself off to his home in Fife, and locked himself in a coalshed. There, for eight weeks, he laboured night and day to create six hour-long episodes. If only others would apply the same polite rules to his own life, and not inquire within. For while his fictional work is “99 per cent imagination” and rarely based on life, if so minded, he could produce a painful memoir of his childhood in Paisley where his mother’s life was blighted by mental illness. The details are ghastly and only fully explained in 2002, when Byrne learnt from a cousin that his mother had been sexually abused by his grandfather, from her mid teens until 31. Later, she was found to be suffering from schizophrenia and repeatedly confined in a local hospital. This discovery did not pitch Byrne into depression. Quite the contrary. “I was just overwhelmed,” he says. “It was the opposite of being upset. It was a total release. I saw it as a justification for my mother’s life. Love finds artistic expression. Next year, Donald and Benoit is published, a children’s storybook that Byrne is writing and illustrating, based on stories he told his twins. Photograph by the excellent Tom Main.